Play is 4 on 4 hockey with no goalies. 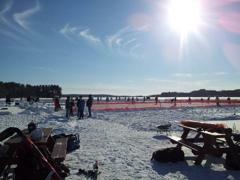 Rink size is 70' x 140'. Each team is guaranteed 3 pool play games. Top 50%, up to the top 8 teams, in each division will advance to Championship play. The division championship rounds will begin Sunday. All players must be fully registered before entering the rink. Only registered players and MPHC officials and volunteers are allowed on the rinks. The consumption of alcohol at the tournament site must be confined to designated areas as mandated by State and Local regulations. No Alcoholic Beverages are permitted to be carried in for this event, they must purchased on site. Snow Pond is a gracious host of our event, and this compliance is needed to protect their liquor license. Team Names/Jersey Logo's: Team names/logos that are offensive, vulgar, or derogatory in nature are prohibited. Please keep in mind that this is a spectator friendly event that is a fundraiser for youth in the community. Your cooperation is appreciated. All players must wear helmets and hockey skates. Additional Protective equipment is strongly recommended. No goalie equipment is permitted. All teams must have matching jerseys, we also request that teams have an alternate "light or dark" jersey in case opponents have closely matched jerseys. 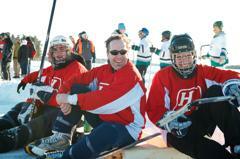 Players must be 18 or older to play in the Maine Pond Hockey Classic. Players may only play on one team for the tournament. Roster substitutions must be made by the start of the tournament. To make a substitution you must inform the tournament director. No other substitutions throughout the tournament are allowed. All games are running time and substitutions can be made during play (players leaving the game must be at their bench area before new skater can engage in play) or while a puck is out of play. There will be one off-ice pond Scorekeeper to monitor play (scoring, time, puck reset, and arbiter of major infractions and disputes). The off-ice Scorekeeper WILL NOT call minor infractions or penalties. It is the responsibility of the Team Captains to manage and control their players during the flow of the game. There are no overtime periods in regular play, ties will count towards team records. During elimination games, teams will play a 3-minute overtime. The team that scores the most will be declared the winner. If the score remains tied at the end of the 3 minutes, play will continue unabated and the first team to score wins. The top 50% of teams (8 max) will advance to elimination play (Championship Rounds). Seeding shall be determined by win/loss record. In the event of a tie, the tie breakers that will be used are in this order; Head to Head Record, Goals Allowed, Goal Differential, Coin Flip. All games are 30 minutes in length with two 15-minute halves. Teams skate 4 players at a time. But may have up to 8 players. The AWAY has first possession of the puck to start the game; the HOME team starts the second half with the puck. Team Captains are responsible for checking with the Scorekeeper at halftime and following the game to confirm the score listed. If a puck goes out of bounds, the last team to touch it loses possession. During restart, the defender must give his opponent two stick lengths of space. Pucks that enter the opening on top of the goal will be considered "out of bounds", followed by a restart in the corner closest to where the puck was last touched. Players should not pursue puck out of play. Scorekeepers will have extra pucks and immediately spot a puck for play to continue. Volunteers will collect pucks out of play. There are no off-sides or icing calls. Goals may be scored from anywhere on the ice so long as the puck is not lifted above the knee. Teams MUST give their opponents ½ ice after a goal is scored or an infraction takes place. Team with the puck must move it quickly so the game is not delayed. The defensive team can engage the team with the puck once all of its players have “tagged up” at center ice. A player may not patrol or remain stationary directly in front of the goal unless the puck has entered the crease area (4ft in front of goal). A defender may deflect the puck in the crease area, but the defender must do so while continuing to move through the crease area, which is defined as a box extending 4 feet in from of the goal mouth. Defensive players may enter the crease area if an offensive player and/or the puck occupies the crease area. Penalties will be called for rule infractions. Penalties are called on honor system. A minor penalty will result in awarding possession of the puck to opposing team. Scorekeepers will have the discretion to also award a "penalty shot" to the opposing team when a minor penalty is flagrant and/or a team is consistently playing in a reckless manner. Any major penalty, which includes any action that could possibly injure another player (Fighting), will result in the offending player being ejected from the tournament. The team that received the ejection will play the remainder of the game short-handed (3 vs. 4). If there are matching major penalties, the teams will play at even strength (4 vs. 4). Off-ice Pond official will determine major penalties. This rule will be strictly enforced! Abuse of Scorekeepers will be considered a major penalty. This includes yelling, swearing, or arguing about calls. No checking is allowed. Such action will result in a minor penalty unless deemed serious enough to be a major. No slap shots allowed. Such action will result in a minor penalty. Contacting the puck with a stick above the waist will result in a loss of possession. Raising the puck (above the knee) intentionally will result in a loss of possession. Players cannot fall or lay on the ice in an effort to protect the goal area. Such action will result in a minor penalty. Players cannot lay their sticks down to protect the goal area. Such action will result in a minor penalty. Any shot that is blocked by such actions will result in an automatic goal. All penalties and violations may be reviewed by tournament staff at the completion of each game to determine if further penalties or sanctions should be assessed to individuals or teams. ©2019 Maine Pond Hockey Classic / SportsEngine. All Rights Reserved.